This is the healthiest, organic banana snack ever - grown in soil alive with nutrients and free of chemicals the way nature intended. 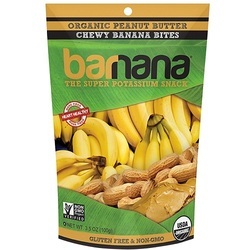 Organic Peanut Butter Banana bites are little nuggets of dehydrated bananas smother in organic peanut butter. We call this product the Elvis., an American household favorite has finally arrived! Enjoy.